If you live in Seattle and you want to explore Israeli cuisine and Jewish dishes around the world, you are in a good spot. During the next few weeks, Seattle will stage the Seattle Jewish Film Festival and will host several events with top Jewish chefs and culinary experts. On Sunday April 3, start your day with the culinary movie Dough, a charming and funny cross-cultural British dramatic comedy that will teach audiences about Jewish breads and baking goods. The movie describes the relationship between a Jewish baker widower and his youngest Muslim apprentice and their close relationship. Directed by John Goldschmidt, this dramedy will make audiences laugh and cry in unexpected places. 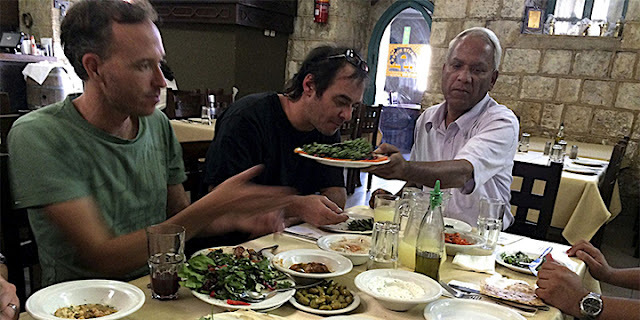 On Thursday, April 7, In Search of Israeli Cuisine, a documentary by director Roger Sherman, is about Israeli’s fusion and dynamic cuisine through the eyes of James Award winner chef Micheal Solomonov. Attendees will be treated to a “taste of Zahav” after the screening. On April 6, Solomonov will do a ZAHAV demonstration class at Hot Stove Society and will offer his culinary creations. On April 16, Joan Nathan, a well-known culinary anthropologist and chef will teach a World Passover class at Hot Stove Society and will offer dishes from her spring Passover recipes. The following day, she will speak about Passover recipes from around the world at the Stroum Jewish Community Center on Mercer Island. Attendees will have the chance to grab copies of her signed book Quiches, Kugels, and Couscous: My Search for Jewish Cooking in France. Finally on May 15, James Beard Award finalist Einat Admony will demonstrate her famous cauliflower recipe, and will reveal a new side of Mediterranean fusion cooking at the Stroum Jewish Community Center. Admony will also teach the Balaboosta Way at Hot Stove Society on Monday, May 16. Some of her Mediterranean meets Middle East recipes include pomegranate chicken with walnuts, eggplant escabeche, and Persian rice. While experimenting with the paleo diet, I look for new paleo diet friendly snacks, energy bars, mixed nuts and nut butter. Most of them are tasty, low in carbs and higher in fat and protein -there are of course exceptions so keep an eye on that super protein bar. I recently discover the Kalot Superfood line of almond, cashew and seed butters that are mixed with fruits and seeds. 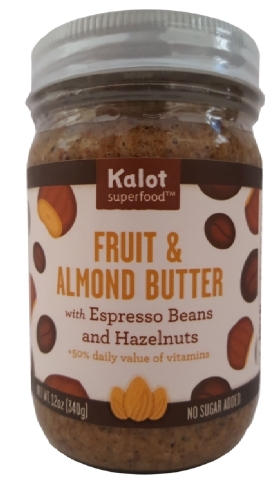 The Fruit & Almond Butter with Espresso Beans and Hazelnuts was the jar that I tried and here is my honest but modest opinion. The Fruit & Almond Butter with Espresso Beans and Hazelnuts (12-oz. jar) is said to have 50% of the recommended daily value of vitamins per serving. It is free from sugar, gluten, dairy and GMOs, vegan and paleo friendly. It is made with dry roasted almonds, hazelnuts, dates, coconut oil, cinnamon, ground espresso and sea salt. In addition, it contains a blend of vitamins including A, B1, B2, B3, B6, B12, C, D2, E, K, biotin, folic acid and pantothenic acid. Let's take a look at the nutrition facts. Each serving of 2 tablespoons (32 g) has 180 calories, 140 of which is fat. The total fat is 15g per serving, 8g carbohydrates, 3g sugar and 6g protein; it is free from cholesterol and sodium is low at 10mg. Overall, it is a good nut butter choice with low sugars and carbs. Nut butters are high in calories due to their fat quantities, therefore they should be eaten in moderation or in smaller portions. The Fruit & Almond Butter with Espresso Beans and Hazelnuts tastes really good for someone who loves almonds, hazelnuts, and espresso beans. I actually love coffee and nuts so this is the perfect blend. The texture is crunchy and nutty and it melts smoothly in a few bites in your mouth. For those who also like coconut oil, is one of the healthiest almond butters currently available. I would like it more with less coconut oil or none but I am not a great fan of coconut oil (and one of the few downsides of the paleo diet) so not really objective. So far, I eat it plain or as a spread on top of favorite fruits. I'd like to use it for healthy desserts. I will keep you posted!